I've been a bad blogger lately. I've been making lots and lots of cakes, but just haven't had time to post any pictures. Hopefully I can get back into the groove. 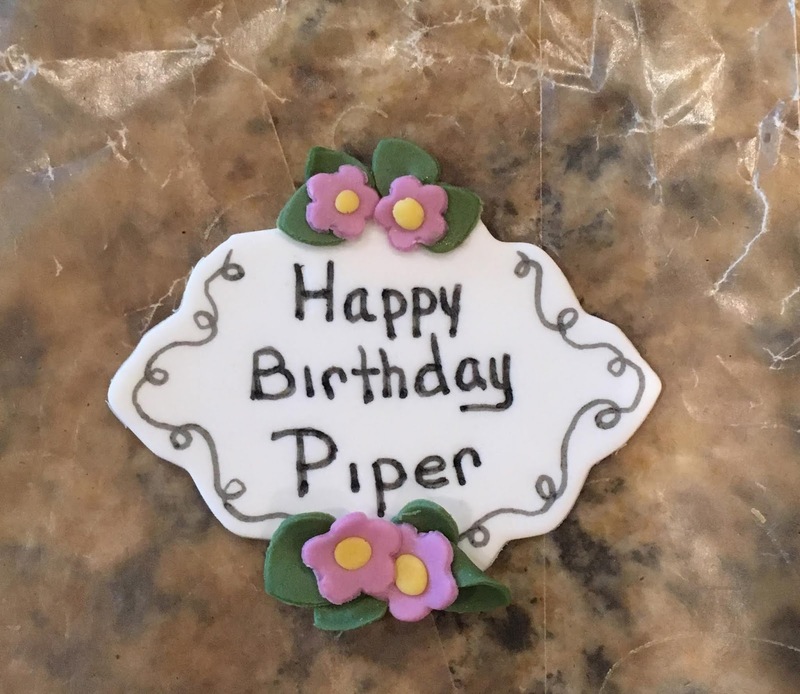 This is a cake I made for my 1st cousin's little girl, Piper. The party had a Princess and the Frog theme, so we decided to make a replica of Princess Tiana's Water Lily Dress and Crown. What do you think? Despite all the froufrou, it was actually a pretty easy cake to put together. 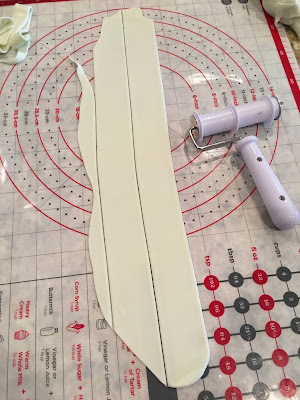 I started with a 14" cake drum that I covered in Electric Purple tinted fondant. The purple is supposed to represent the water of the bayou. Not very realistic I know, but I think the color makes a bold contrast to the yellow and green of the dress. Also a word of caution about the Electric Purple gel color... The pH of some fondants cause a chemical reaction that mutes any red tones in the food gel coloring. Instead of getting Electric Purple I got muddy violet. Adding baking soda to the fondant brings the pH back in line and allows the reds to become visible again. 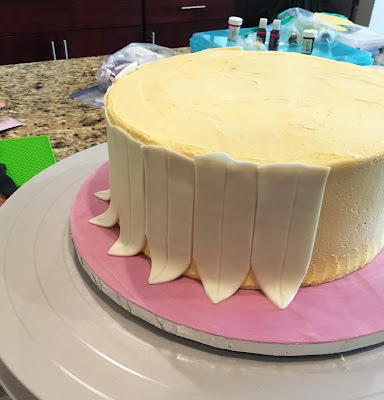 The baking soda gives the fondant a nasty taste so you don't want to put baking soda laced fondant on a cake, but it's fine for using on the cake drum. This two tiered cake is made of a 10" Oreo cake with cookies and cream frosting, and a 7" chocolate cake with chocolate cream cheese frosting. 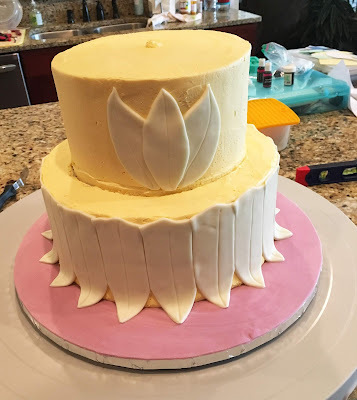 After frosting the 10" bottom tier with American Buttercream tinted with Wilton's Buttercup Yellow gel color I placed it on the prepared cake drum. For the petals I colored my fondant with a mixture of Avocado and Leaf Green gel colors. It was probably about a 3:1 ratio of Avocado to Leaf Green. The Avocado green looked a little dull, so I added the bright Leaf Green to brighten it up a bit. For the first layer of petals I mix just a bit of my prepared Avocado/Leaf Green fondant with a lot of pure white fondant. I rolled the fondant out and then cut 1-1/2" strips using my Wilton Ribbon Cutter. 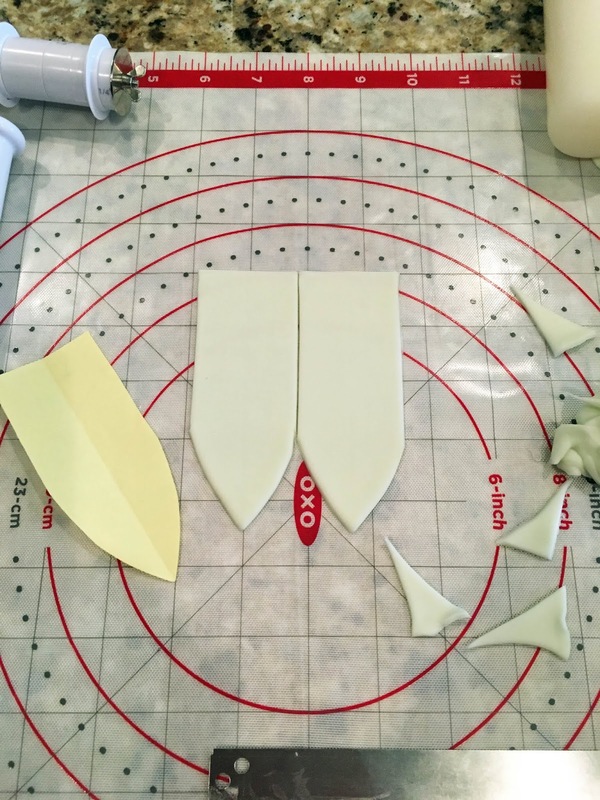 I then use a paper templet to cut out the individual petals. Next I used a scoring tool to press a line down the center of each petal. Then onto the cake the greenish-white petals went. 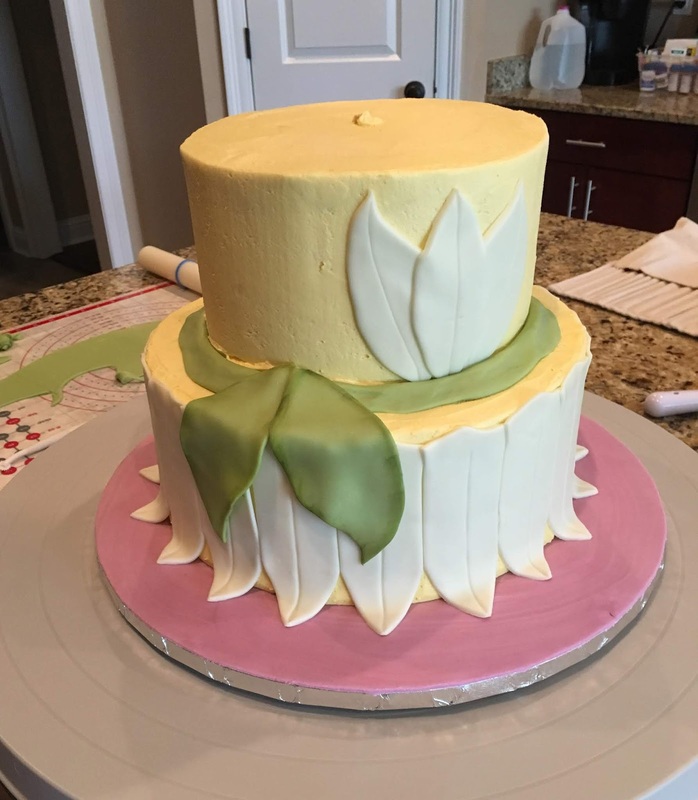 I let the petals overlap the cake drum which adds a little motion to the cake. I wanted it to look like the dress was swishing around on the purple "bayou water". 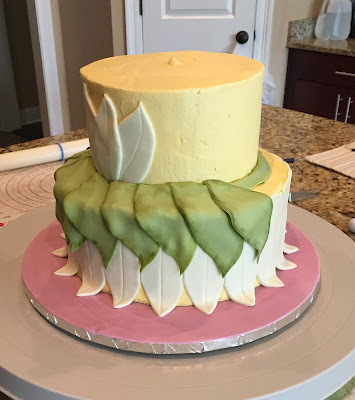 After stacking the top tier onto the cake, I added the Water Lily petals to form the bodice of the dress. I also made this same petal pattern at the back of the dress. Next I started on the green leaves. Again I used a hand drawn paper templet to cut out the leaves. 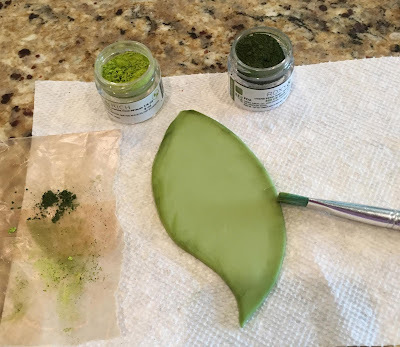 I dusted the edges of the leaves with some green edible petal dust. This dusting gives the leaves some depth, and it keeps the leaves from looking like a green glob of nothing once they are placed on the cake. Then onto the cake went the green leaves. I started at the section where the Water Lily flower would go. 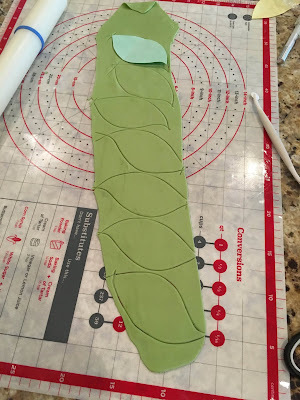 I positioned the leaves so the curved tips pointed towards each other. 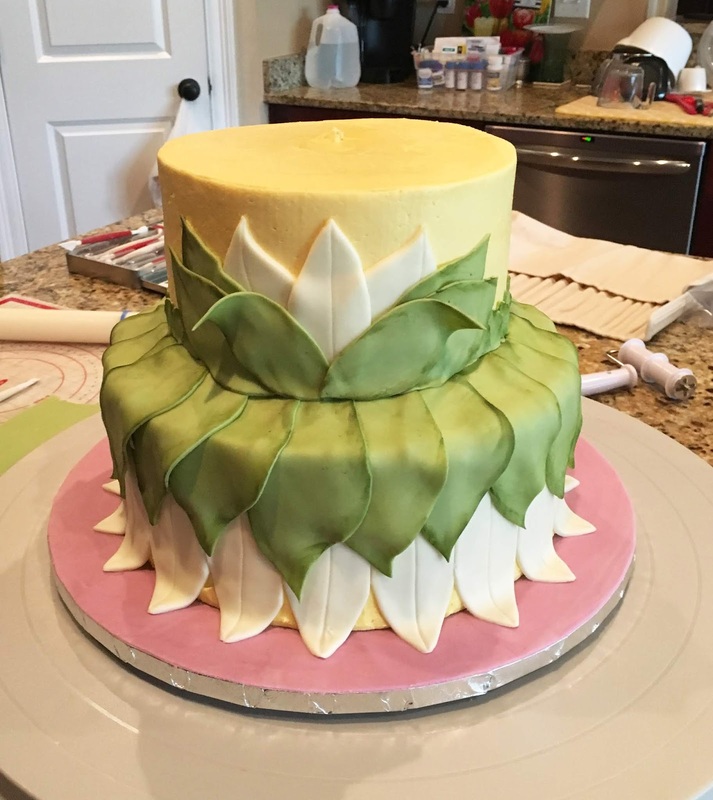 I also put a wedge of green fondant around the base of the top tier. I did this so the tops of the leaves would slope down and away from the "waist-line" of the dress. Then I just kept adding green leaves. I didn't press the leaves down because I was going for the swishing motion look. Think Tiana dancing around the bayou with her frog prince. After the petals and leaves were on the cake I made the flower for the side of Tiana's dress. I didn't have a water lily fondant cutter, so I just used a Daisy Plunger Cutter. I also embedded some Wilton Flower Stamens into the yellow center of the flower to make it match the original dress. 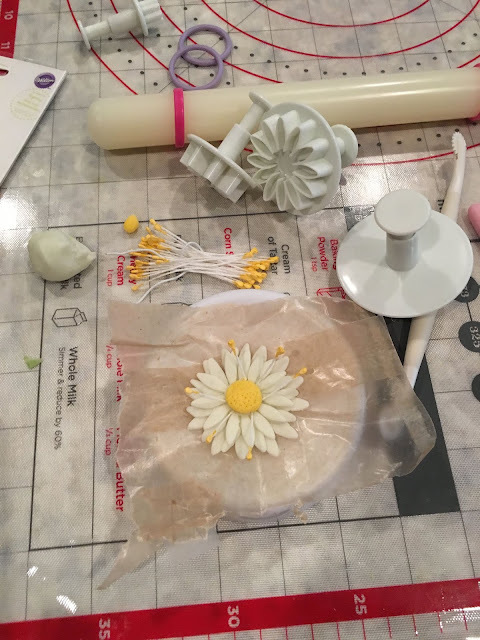 I also made some extra flower to go on the water lily pads floating in the water. 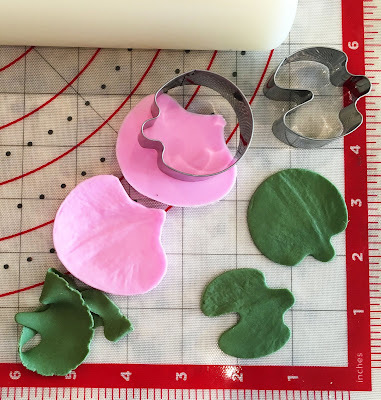 I didn't have a water lily pad cutter, but I did have a Sweet Pea Cutter. It sort-of looked like a lily pad, so I used that. Sorry I forgot to take picture of the Water Lily Crown as I was making it, but I used the same fondant with a lot of Tylose Powder added to it. 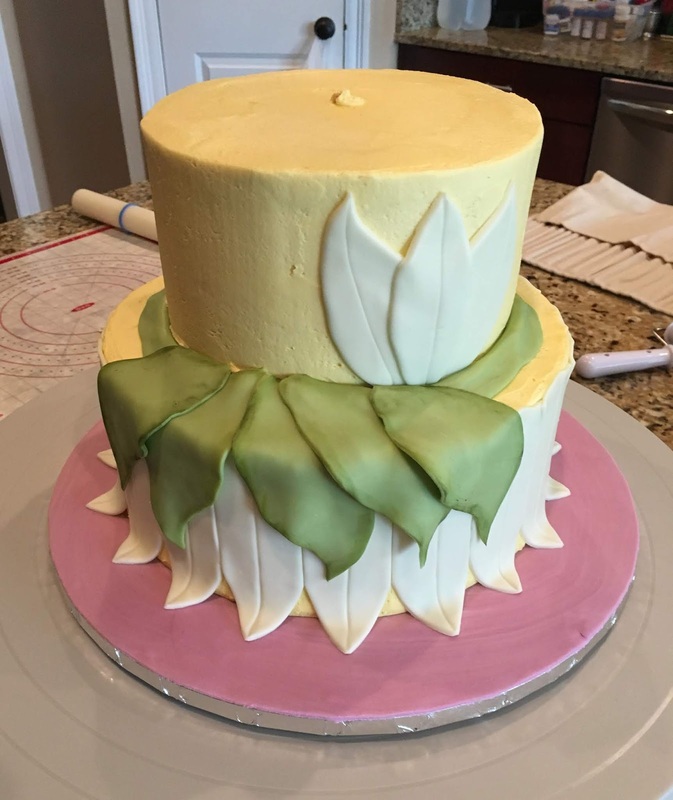 I cut out the petals and let them dry curled around a 5" cake dummy. For the stamens in the crown I used some Wilton Gum Paste Floral Wire with a little blob of yellow gum paste stuck on the tip. As a last touch I made a little Happy Birthday plaque out of gum paste. It turned out a little sloppy because I had to make it in about 5 minutes. 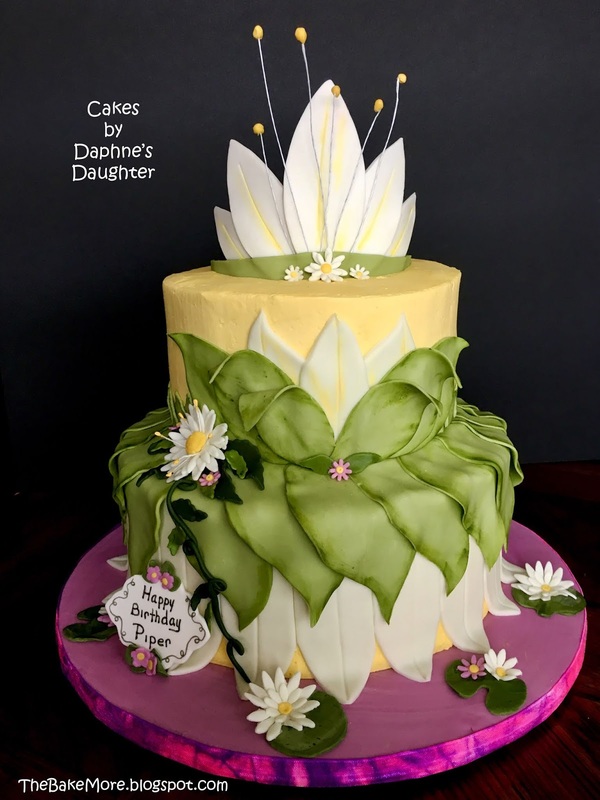 When I was taking pictures of the finished cake I noticed a "blank" spot to the left of the green vine that screamed to be filled. I cut out some gum paste using a plaque cutter, drew on Happy Birthday with an edible pen, and stuck on some tiny purple flower. Done! So despite how it looks, this was actually a easy cake to make. Nothing too complicated or involved. And in case you were wondering, this is what the back of the cake looks like. On the rear of the crown you can see where I hid the thin wooden skewers I used to support the crown. This cake had to travel almost 100 miles to the party, so I wanted to make sure the crown didn't fall off. 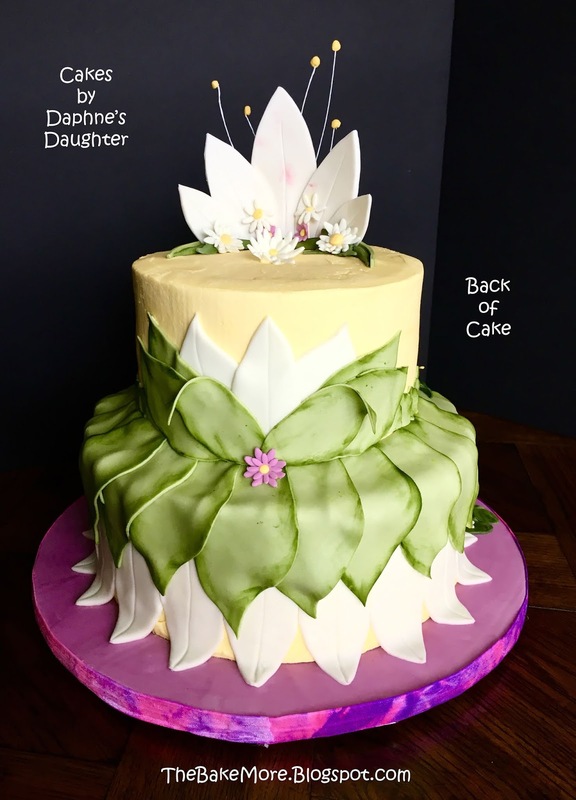 I am a geophysicist who loves to bake, decorate cakes, and dig into the science behind how and why baking works. Not all of my experiments are successful, but it is fun figuring out what went wrong.